Biocat launches a new Bibliometric report which makes available to researchers and society statistics on scientific production in biomedicine carried out in the BioRegion of Catalonia in 2012-2016. The dynamic tables of the platform allow users to check the production and impact of each research center, university, hospital, etc. individually, or customize the search by scientific discipline. One out of six (16,5%) publications in biomedicine signed by researchers in the BioRegion are among the most cited documents, tripling the percentage of publications of excellence expected by its volume of production (RHCP 3,052). The impact of Catalan publications in biomedicine was 15.7% above the global average (RCI 1.157). These are some of the conclusions of the study, launched by Biocat in collaboration with BAC (Bibliometric and Evaluation in Science), an inter-institutional Research Group on Bibliometrics currently participated by Fundació Catalana per a la Recerca i la Innovació (FCRI), Institució Centres de Recerca de Catalunya (iCERCA), Barcelona Biomedical Research Parc (PRBB) and Pasqual Maragall Foundation for Research on Alzheimer (FPM). Oncology, Pharmacology and Clinical Neurology were the most active disciplines in the period 2012-2016 while Pneumology, Dermatology and Primary Care achieved the greatest impact. • 64.5% of Catalan biomedicine publications have at least one hospital or related entity referenced by the authors: Hospital Clínic and Vall d'Hebron Hospital are the most active in scientific production. With reference to universities, the most active are the University of Barcelona and Universitat Autònoma de Barcelona (UAB), followed by the Universitat Pompeu Fabra (UPF). Regarding public research centers, the Catalan Institute of Oncology (ICO) and ISGlobal, stand out. Also worthy of mention are the Center for Genomic Regulation (CRG) and the Catalan Institution of Research and Advanced Studies (ICREA). 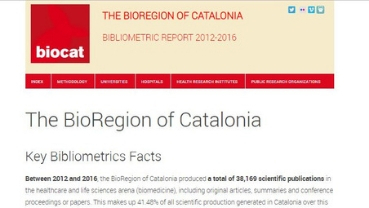 Between 2012 and 2016, the BioRegion of Catalonia produced 38,169 scientific publications in the healthcare and life sciences arena (biomedicine), what means 1.2% of the worldwide total, 3.51% of that in Europe (EU 28), and 34.1% of that in Spain. In this period the United States, China, England, Germany, Japan, Italy, Canada, France, Australia and Spain (including Catalan production) were the top 10 countries on the global ranking by volume of biomedical publications. With 38,169 documents published in this field, Catalonia would be ranked 23rd in the world. More than half (52.4%) of all Catalan publications in biomedicine involve collaboration with authors from other countries. This is the highest percentage in Spain. Catalonia ranks among the top 15 in the European Research Area (ERA) for total number of publications in the Nature and Science journals: in particular, between 2013 and 2017 authors in the BioRegion published 190 articles in these prestigious scientific publications, being comparable to Belgium (248) or Israel (244) and higher than countries such as Finland (140) or Ireland (101). In terms of publications in Nature and Science per inhabitant, Catalonia ranks in position 12 among ERA countries, above Belgium, Germany or France, among others. Over the five-year period from 1992 to 1996, 2 in 10 authors of Catalan publications in biomedicine were women (80% men, 20% women). However, from 2012 to 2016, the proportion of men to women was 65% - 35%, much more balanced than before, however growth in this area has stagnated in recent years. These percentages include all authors that sign a publication, without taking into account the signing order.